With its two sections, Everyday and Friends, this is as much a guide for entertaining as it is an everyday resource. Food to impress needn't be complicated to be impressive. 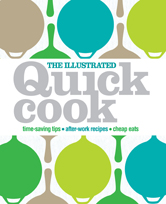 With the quick-cook theme running throughout both sections, you will find instant inspiration for every occasion.